Deep Web sites expose data from a database, whose conceptual model remains hidden. Having access to that model is mandatory to perform several tasks, such as integrating different web sites; extracting information from the web unsupervisedly; or creating ontologies. 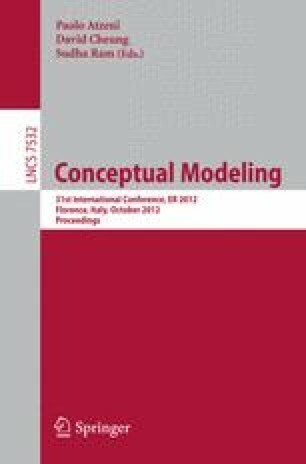 In this paper, we propose a technique to discover the conceptual model behind a web site in the Deep Web, using a statistical approach to discover relationships between entities. Our proposal is unsupervised, not requiring the user to have expert knowledge; and it does not focus on a single view on the database, instead it integrates all views containing entities and relationships that are exposed in the web site. Supported by the European Commission (FEDER), the Spanish and the Andalusian R&D&I programmes (grants TIN2007-64119, P07-TIC-2602, P08-TIC-4100, TIN2008-04718-E, TIN2010-21744, TIN2010-09809-E, TIN2010-10811-E, and TIN2010-09988-E).